The Indira Clementine Cushion has it all - from pompoms and fringing through to tufting! 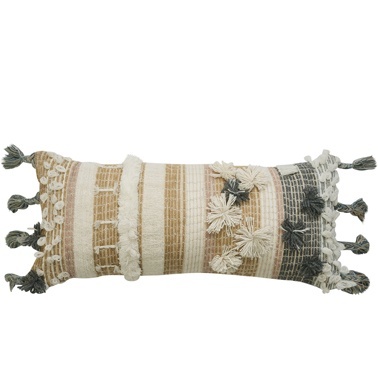 Full of texture, the cushion is hand woven and finished with two-toned tassels on each end. The reverse of the cushion is a plain Grey cotton. The Indira collection is a sweet range with everything from hand woven textiles to hints of block printed metallic. Each cushion is totally unique with a special detail, be it fringing, tufting or pompoms. The collection is made in a palette of tonal Greys, with Dusk Pink and hints of Green.